Red is language, blue is gesture. The upper arrow represents Western language and gesture, with the upper part, language dominant, and the gesture supporting, emphasising and clarifying the linguistic meaning to convey the same message. Kendon (Gesture: Visual Action as Utterance) seems to espouse the view that gestures is generally, or universally bound up with language, as shown by the red-blue arrow. The lower two arrows represent my feeling about Japanese gesture and language. In Japanese culture which emphasises the split between real meaning (honne本音) and social pleasantry (tatemae　建前), and has lots of essentially non-linguistic fawning (amae 甘え) and ESP (ishindenshi 以心伝心）, or extolls people to "read the air (or non-verbal cues?)" 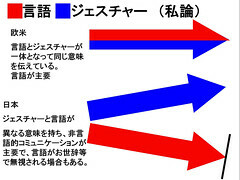 (KY, kuuki wo yomu, kuuki ga yomenai空気を読め、空気が読めない), it seems to me that the two channels, gesture and language can mean different things (hence two arrows), the non-verbal blue arrow can be the true/real/main channel, and the language can be phatic or supurfluous and ignored (hence the bar). I used to get the feeling (real or imagined) that Japanese verbal and non-verbal communication was tearing me in two like Bateson's schizo producing "double bind," because while I was attempting to attend to the verbal message. It felt like the sender was sending, and other recievers were reading, correctly, the sender's non-verbal communication that meant something else entirely. I feel that Britons do the same thing, when they are being sarcastic. On the other hand Americans especially tend to tell it to you straight, "watch my lips", with the two channels bound together. It could be argued however, that Japanese real meaning (honne 本音) is transmitted equally in the verbal linguistic domain, and it was just that I was not able to decode these linguistic meanings correctly. Such as when someone says "thats good" (ii desu いいです） or "I'll think about it" (kangaemasu 考えます） then even in the absence of non-verbal cues, a Japanese person would decode these statements correctly to mean "no thank you" and "the answer to your request is no" respectively. Thus Japanese verbal communication may be at one with Japanese non-verbal communication, but that one should interpret certain verbal statements in a non-literal way. In a series of papers (e.g. this interesting study) by Sotaro Kita, a professor at Birmingham University compared for instance, Japanese, Turkish and English speakers use of gesture to describe a cartoon showing someone on a swing. Dr. Kita points out that there is no verb "to swing" in Japanese or Turkish. He further found that English speakers moved their hands in an arc when saying "swing" but that Japanese and Turks, when using more general movement verbs meaning "go", moved their hands in a linear movement. Hence the lack of a verb "to swing" (to move in an arc) results in a lack of a arc motion, swinging gestures. If it really were the case that Japanese gestures were independent of speech then one would expect them to move their hand in a swinging arc even though they do not have the verb to express that motion. Since this is not the case, it seems to suggest that Japanese gesture is closely integrated with Japanese speech rather than being an fully independent channel. While some information (notably the direction of swing) was gestured but not spoken, suggesting that gesture is to some extent independent of speech, this tendency to encode extra-verbal data in gesture was the same for all languages in the study. Hence, the diagram above seems to be demostrably wrong. But I still get the feeling that Western gesture is more integrated with speech, and that language and gesture form a single/merged channel to a greater extent than in Japan. Stop press. I have just read the final line of the Sotaro Kita paper linked above, which ends "There are initial findings that speech gesture synchrony differs accorss different languages"
and Turkish. I am guessing that Dr. Özyürek found greater integration in English than Turkish and that this patter would also be found between English and Japanese. So why do Japanese people wear these "hachimaki" headbands? I am thinking in particular about the headbands worn by people studying, rather than the headband worn by the gentleman in this photo, who is taking part in a festival but the following might be applied to anyone wearing a headband with writing on it. logo-culture, may make a pledge to others and themselves, and remind themselves of their intention to study using phonological thoughts (that is to say remembered and orally produced but silent phonemes) their mind "I've gotta study. I promised everyone I would study. This test is really important to me." Westerners are said to be able to simulate how they sound to others, that is to say they hear the words that the speak from the others point of view, and internalise the reactions that others would have upon hearing them. This is the essence of logocentrism: phonetic words are thought to provide "presence," (is that what Derrida calls it?) the immediate, inseparable, instantiation of their objective meaning. It all sounds so persuasive. Words just mean. But perhaps to some (to Japanese people) spoken words are communicative - allocentric, *for others*. Perhaps the Hajimaki headband, which usually has ideograms written on it like "try hardest" "must win" is a bit like these pledges and resolutions. They seem to be more allocentric (is that the word?) in that the signs are all pointing outwards, to others. And to an extent this is the case. The headband is far more like a pledge to others. But I think that the wearer will also be made aware of the fact he or she is signing his or her intention to study hard, so the signs and the headbands, often worn in private, so they are also a message to self. Japanese are thought to be able to simulate how they appear to others, that is to say they see themselves from others' points of view and internalise the reactions that others would have upon hearing them. Hence, and I guess that this is the nub of imago-centrism, signs (visual ones) mean as soon as they are out there, like they are shouting a message, like they are one of those loop tapes that Japanese are so good at ignoring. The fact that signs are so "loud" (from a western point of view) may be why the japanese avoid Japanese writing on their T-Shirts. To have a T-shirt with "Frankie Says War" (this reference is probably way too ancient for you) would be like going around saying "Frankie Says War, Frankie Says War" to everyone they meet. The headband is like that. "I am studying, I am studying, I am studying" it is a sign of and a self-stimulation to persist. 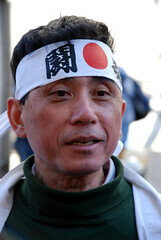 Looking on flickr I see that many hachimaki have nothing on them. In that case I suggest that they may signify a mental, spiritual purity, singularity of purpose and the absence of phonemes in the mind. One of the scary things about Japan and the West is that each seems to hate they others signs/symbols. Derrida goes on about how much writing and visual signs are derided (he puns on his name I believe) in the West. I often get the feeling that a lot of the purification ritual in Shinto is aimed at a silence of mind. And Zen Buddhism is quite explicit about it: out out damn language.